I haven't shaved since Dec 31st. There's no real reason why. It's not "no shave January" or anything like that. I've just gotten up each day, considered shaving, and thought "Nah, not today." Richard, the music assistant at church, told me last night that people were starting to ask him if I was growing a beard for our Easter musical. We're already working on the songs, but I haven't yet let anyone know what the musical will look like. Drama? Narrators? Video? The answer will be announced next week. 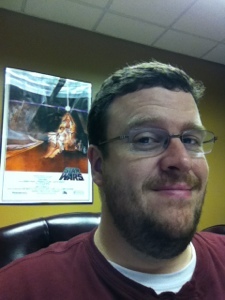 I will say, I am not growing a beard for our Easter musical. He is growing a beard for the musical. Because we really haven't seen a good overweight portrayal of Jesus recently. 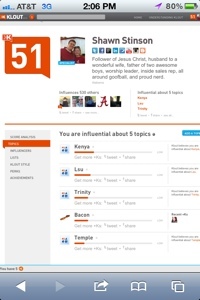 According to Klout.com, I'm a specialist in bacon. I am influential on the topic of bacon. I'm not sure exactly how it knows this, but I think it has something to do with how many people have commented on or retweeted something I've said online about glorious bacon. Am I surprised by this? Not really. But I do wish it had listed something different, like worship or marriage or parenting. But instead, I am honored to be considered a bacon pro. So going forward, if you have any bacon related questions just let me know. I'm on a diet again. Let's see if I can become a specialist on a topic a little less artery clogging. I am not blogging today. My lack of a blog entry is in protest of SOPA. So, there. No post today. You can blame "the man". My reason for not blogging the past 60 something days?